Got some time next week? I’ve got another sew-along planned! wahoo! ;} It’s called the Emma dress, after another one of my nieces! I love using ric rac, and had so much fun playing around with the off-center front bodice and collar. Man, Charlotte sure knows how to work the camera! This gorgeous fabric is Cut Out & Keep, Berry Bush, from my fab sponsor, Bloomerie Fabrics! I get my ric rac from my equally fab sponsor, Ribbon Retreat! The white fabric is just some quilting cotton from Joanns. I am in love with this dress! Definitely one of my all-time faves. 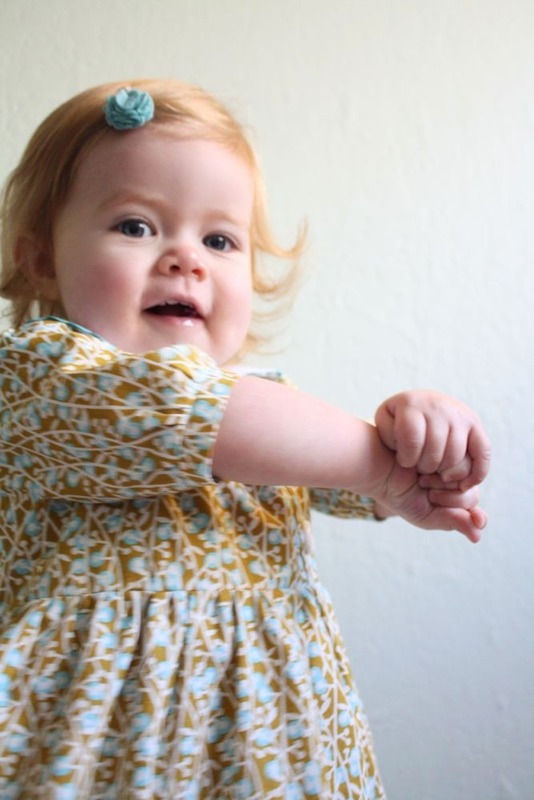 I’ll also have a 18-24 mo pattern available to download (free of course!). Sorry I can’t do all the sizes for ya, someday perhaps! I will show you how to make your own pattern of course. This sew-along will be a 3 Part series starting Tuesday, January 17th, and will end Thursday, January 19th. Can’t wait! Are you in? Wonderful girl and wonderful dress! Sooo pretty! Munchkin and dress both. I’m so in. I’ve got a 20 months old cutiepie to dress up. Now for picking out the perfect fabric! I’ve borrowed your picture for a blogpost. Please let me know if it is not okay. I am in! I’ll try to do it this time!… and maybe I can make it bigger for my 5 year-old girl too! Awww how cute is that! Will try and find time to join in. Very cute! I probably can’t play along net week since I will be babysitting my 17mo niece on top of all my own kids (and I hear she doesn’t nap). Hopefully, I can make one later, though. 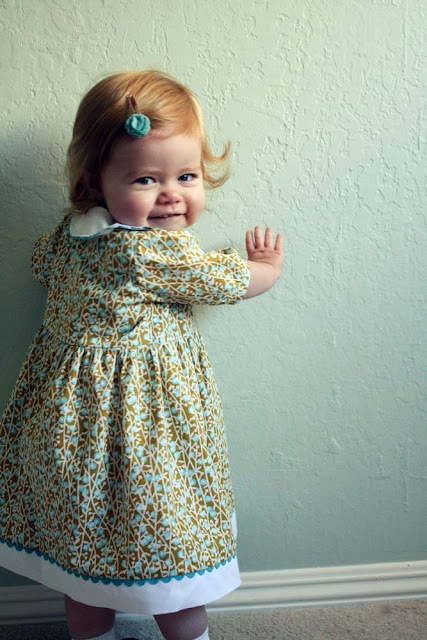 Cute cute cute – adorable dress. I can’t believe how big C is (and what a natural in front of the camera)! I remember when I first started following your blog and she was just a tiny tot who couldn’t even crawl yet! I’m in. Love your patterns. This is just SO cute! 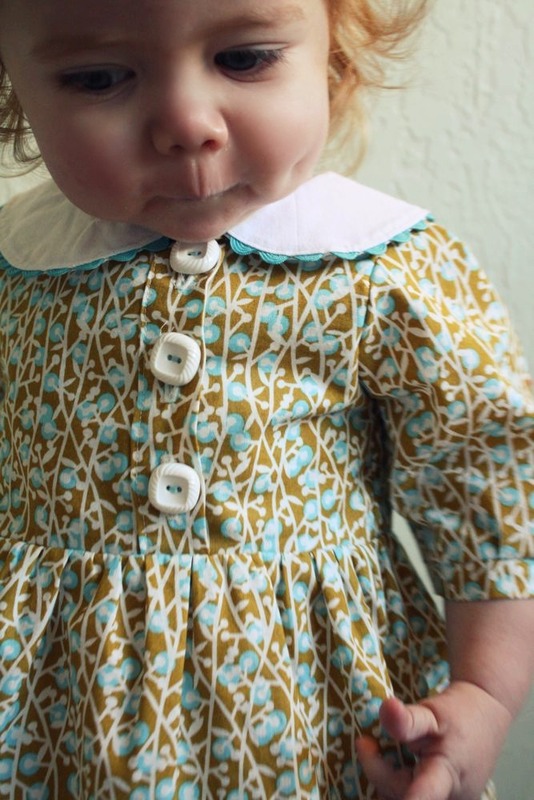 I don’t think I can join in, but I love the dress, and the fabric is adorable! Gorgeous dress!! And love your blog too!! I added your blog to my favourite list.Hop you don’t mind… Now you have fans in Italy too!! All is in Italian, but clearly understandable from images. omg, that child is darling. her face just wants to be kissed!! love the dress and the print too! I wish I could join in on the sew along but I feel like I already have a bazillion projects queued up right now and need an intervention as it is…finishing one skirt and starting a matching one for the baby, more treasure pocket pants for both kids, more long sleeved tees, testing a pattern for shwin&shwin (neat!! ), a mini quilt for my mom….omg now I feel a bit sick…lol. help! Óuuwww, your child is so lovely! I love the dress. Kisses in your baby. kisses Jess, I love your ideas. Hehe…I don’t know if I’m ready for two off centered dresses in Char’s wardrobe…but I do love ric rac…and her middle name is Emma…might have to join anyway! no idea why ric rac became ric arc (must be a spellchecker thing)!! Love, love, love this dress! I am thinking of doing one for my little’s second birthday in May. ADORABLE!!!! I’m IN, especially if you have a pattern. I do such much better with patterns. I don’t know how you do the whole trace-the-t-shirt thing and have it come out right. Never does for me. I lost my sewing motivation over the holidays but i’m happy to say it is back…i’m in!! 🙂 Can i just squeeze her?? Oh how adorable! And the dress is cute too. I’m so excited to have a baby girl so I can sew clothes for her! Adorable! I think I might just have to make a doll-sized version! Looking forward to the sew-along! So cute Jess. I haven’t joined you in a sew-along in forever. I’m hoping I can do this one. You always make everything so simple. Oh my goodness….this is super adorable…and she looks precious in it. Great job!! 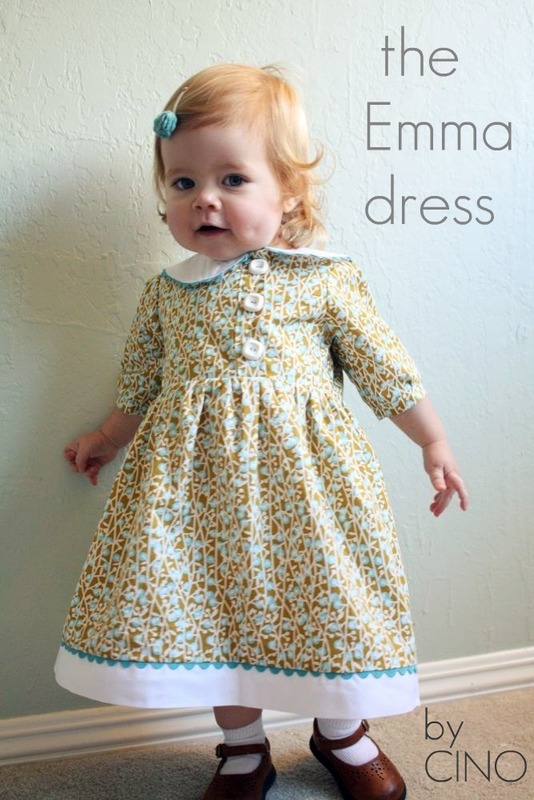 What an adorable dress (and model)! I will try to be here but my approx daily time needed will be more like two hours since I’m not that good at clothing sewing. I MUST learn though since we have our 2nd granddaughter being born very soon…..as in weeks from now if she holds out that long. I think I’m gonna try and make one in a size 5! Yikes, I hope I can do it! So cute! It’s a so nice dress! I would like to make one for ma little niece! Gorgeous dress! It’s such a pitty, that I have no child to sew for… Nevertheless i wish you all great fun. This is soo cute! 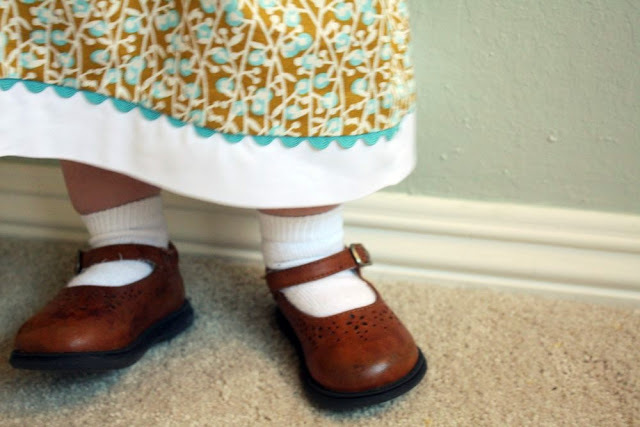 I would love to try the sew along, my daughter is in 2t. I’m excited and nervous I hope I can do it! 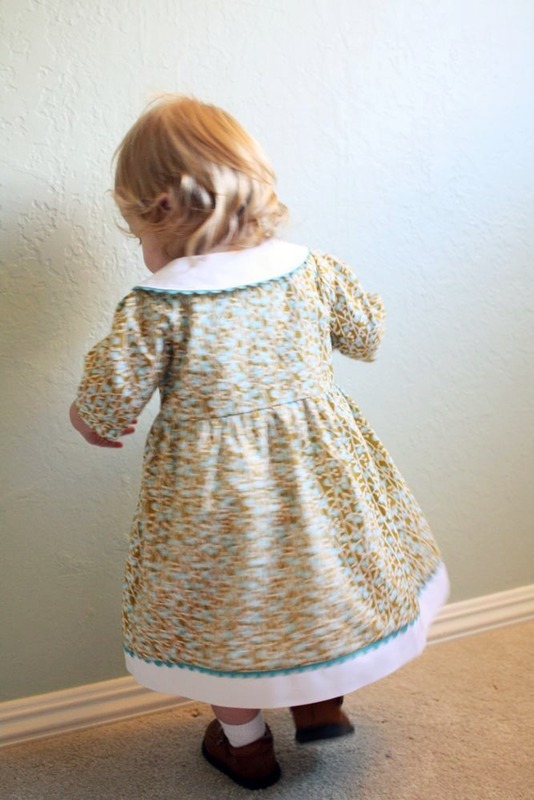 This is just the dress I had in mind to make for my niece out of some lovely corduroy I picked up. It’s also the perfect excuse to finally clean up the sewing room of the Christmas mess I left in there. If the pieces seem simple enough to make into a size 5, I’m definitely IN! This is such a cuuute dress – looking forward to it! Yay! Looks very cute! Is there an easy way to make the bodice centered? I’ve never done one before, but I would love to give it a try. You’re little girl is adorable by the way. Wondering if I could get the pattern for the 18-24 month size? Thinking I could try my hand at it for my daughter for her Easter dress…. I would like to sew along!